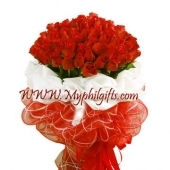 A sumptuous grouped hand tied bouquet of exquisite 99 long stem red roses finished with red and white special paper, a favorite with everyone. This bouquet will surely be a big surprise! !